There is something about summer that makes me feel like a kid again. I have an unrelenting urge to run around barefoot in the grass, draw on the driveway with chalk, make friendship bracelets until my fingers are sore and stuff myself silly with ice cream. Did I mention that I’m 33 (and soon to be 34) years old? Oh well. Those pesky little numbers don’t really mean much. Also, ice cream knows no age boundaries. While I still love many of the classic ice cream flavors (cookies and cream for life! 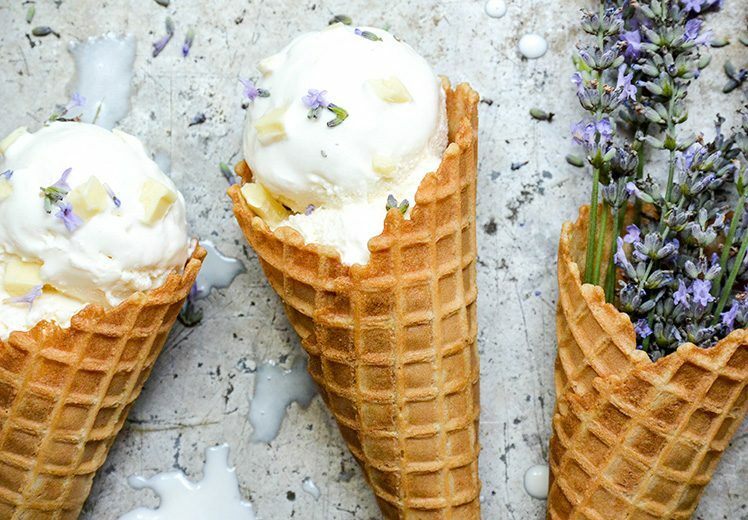 ), I’m also really getting into more “sophisticated” flavors, like this Lavender White Chocolate Chunk Ricotta Ice Cream. With it’s subtle floral accents and just the right level of sweetness, it’s certainly a more grown up treat. And it’s definitely a lot classier than bubble gum ice cream, which was one of my old standbys as a kid. I’m happy to report that my tastes have matured over the years. This recipe doesn’t use an egg-based custard, which makes it a cinch to pull together. And it’s fairly fool-proof as well (no scrambled eggs here!). But the downside is that ice creams made without a custard base have more of a tendency to become icy and hard after a couple days in the freezer. 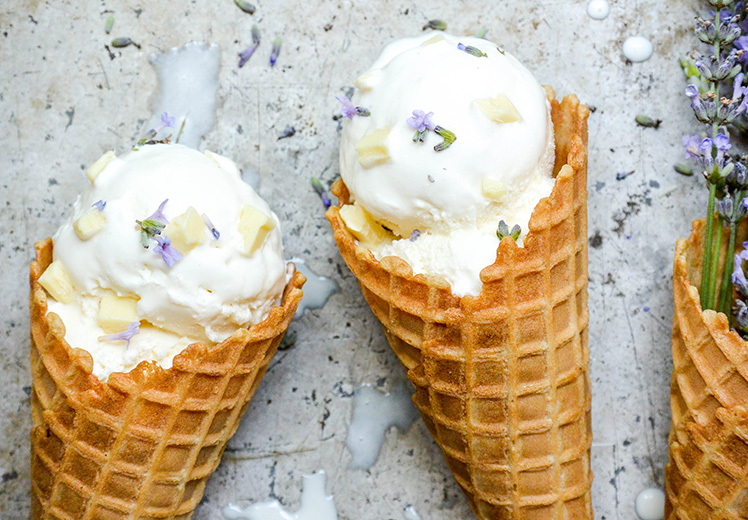 One way to combat this problem is to add a little alcohol to your ice cream during the churning process, which lowers the freezing point and helps the ice cream stay creamier and smoother. For this recipe, I used vodka because it has a clean taste that is undetectable in the final product. But it’s totally optional and feel free to leave it out, if you prefer. In a small saucepan over medium heat, warm the heavy cream. Stir in the dried lavender. Remove the pan from the heat and let the lavender steep in the heavy cream for 1 hour. Then place a fine mesh strainer over a clean bowl and pour the heavy cream through the strainer. Collect and reserve the infused heavy cream. Discard the dried lavender. In your blender, blend the ricotta, cream cheese, whole milk, sugar, vanilla extra and salt until smooth. Add the lavender-infused heavy cream and blend until just combined. Transfer the mixture to a clean bowl. Cover with plastic wrap and refrigerate until well chilled, at least 3 hours or up to 24 hours. 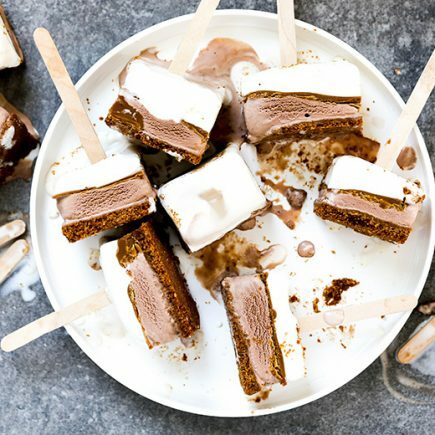 Once chilled, pour the ice cream base into the canister of your ice cream maker and churn until the mixture is nearly frozen and the consistency of soft serve, about 20 minutes. Add the chopped white chocolate and the vodka and churn for another 2 minutes, or until the white chocolate is evenly distributed. Transfer the ice cream to a freezer-safe container and place it in your freezer. The ice cream should become firm in about 3-4 hours. Let the ice cream sit at room temperature for a couple minutes to soften slightly before scooping and serving. Enjoy! 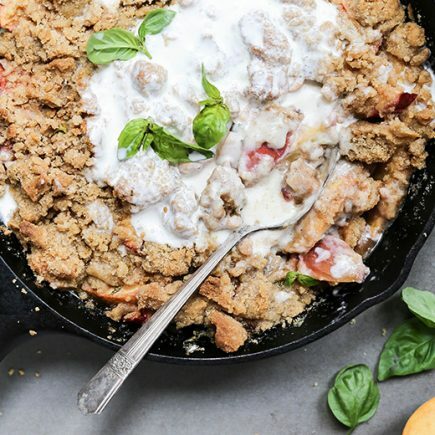 This sounds absolutely delicious, and you photos are beautiful too! !